Sailors in the market for a traditional, solid cruising boat under 30 feet have two options: They can spend $150,000 or more for a custom-built boat or they can spend a lot less for a used production-built boat. The Cape Dory 28, offered by Cape Dory Yachts from 1975 to 1988, is the latter. The Cape Dory 28 was designed by Carl Alberg, whose conservative design style seldom wavered, regardless the size of the design. I suspect he didn’t like tinkering much with a proven formula. The Cape Dory 28 features a full-length keel with attached rudder, relatively low freeboard, a very handsome sheer, and a well-proportioned traditional trunk cabin. The bow and stern are nicely balanced, and overhangs are a bit shorter relative to the overall length than Alberg’s earlier designs. A teak bowsprit extends 20 inches beyond the deck. 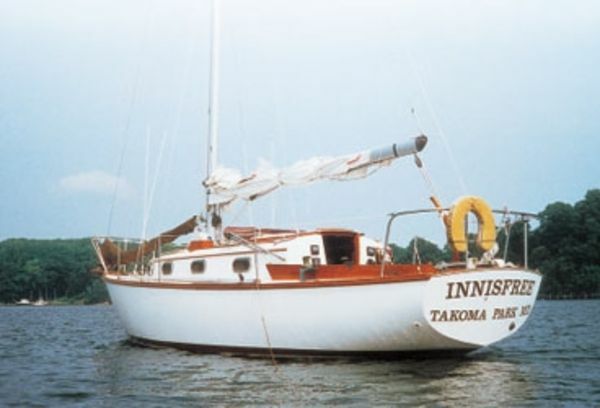 Hulls are constructed of a solid fiberglass laminate and are often trouble-free, with the exception of occasional osmotic blistering below the waterline. Blistering is not usually severe, and I have yet to see a case that seriously compromised the safety of the boat. Decks, on the other hand, are constructed using a core of plywood or balsa, which can produce stress cracking. If left unattended, the cracks allow water into the core and eventually weaken the structure. If this happens where chain plates and other deck hardware are attached, it can result in the loss of the rig or injury to a crewmember. Another common problem of aging Cape Dory 28 models is deterioration of fuel tanks. The cylindrical steel tanks used on some models may be badly rusted. Additionally, the welded aluminum tanks used on most models are mounted on a plywood base and held in place by wooden cleats around the bottom of the tank. When wood comes in direct contact with aluminum, it causes pitting and, eventually, failure. Fortunately, the tank is accessible through the port seat locker, making replacement a simple task. The deck arrangement is well balanced. The foredeck is large enough for sail handling and ground tackle; side decks are wide enough for safe passage; and the cockpit is large enough to accommodate four adults. Most 28s have tiller steering that can be easily stored at anchor, and the mainsheet attaches aft of the cockpit so as not to interfere with passengers. The interior features a v-berth forward, followed by a port head and starboard hanging locker. Originally the main saloon had a small pilot berth behind the port settee and a starboard settee separated by a drop leaf table. After the first year or so of production, the port pilot berth was eliminated in favor of a larger settee that slides towards the centerline to form a double berth. However, the berth is much too narrow for two adults. The galley is aft with an alcohol stove to port and a sink and ice box to starboard. Two opening deck hatches and eight opening bronze ports provide great ventilation for a boat of this size. Most Cape Dory 28s are powered by two-cylinder, 15-hp Volvo diesels, which are loud and will shake your fillings loose, but when properly maintained they have very long lives. In the latter years of production they were offered with lighter and quieter 14-hp Universal diesels. I have seen at least one 28 powered by a Farymann 10-hp engine, which was not sufficient, but both Volvo and Universal engines provide acceptable power. The engine is reasonably accessible for service from the cabin and cockpit lockers, although the shaft packing gland is nearly impossible for an average-sized person to reach for service. Cape Dory 28s were originally rigged as sloops with self-tending, club-footed jibs. Anyone who has ever beat up a narrow channel in a stiff breeze will appreciate the benefits of this sail arrangement. However, these are not conditions we often encounter on the Chesapeake, so many Bay sailors have opted for a roller furling genoa instead of a club-footed jib. I have seen others opt for a cutter-type arrangement leaving the small jib and adding a genoa. This is a good arrangement for some sailors, but tacking the genoa will require going forward to pull the sail through the slot or furling the genoa and unfurling it on the new tack. The displacement length ratio of the Cape Dory 28 is 369, and the sail area to displacement ratio is only 14.9 with the club-footed jib, so a 150 percent genoa is a must-have for sailing in winds under 10 knots apparent. With nearly 500 Cape Dory 28s built over the years, finding used models is not difficult. If you’re looking for a small cruiser with offshore cruising potential and classic style, and you don’t mind sacrificing the extra interior elbow room offered by more contemporary 28 footers, then the Cape Dory 28 may just be your ticket to sailing happiness.